Starting again after a relationship has finished is never easy for the one left behind, especially when they see that their ex is moving on and has a new partner. Emotions can be very high at this time and if your client is in this situation they may feel vulnerable, rejected, let down, even hatred towards their ex and jealousy towards the new partner which is intensified if they were the reason for the break-up. Your client will need all the help they can get to deal with these negative emotions. In a way it is a little similar to a bereavement where certain stages are passed until acceptance takes place - the main problem being that their ex is often still around (when children are involved) to remind them of all that was. You can help your client to forgive those that have caused hurt as well as accept that this is an opportunity to do new things with their life and this Newly Single hypnosis script provides a useful approach towards allowing your newly single, just divorced or separated clients to start afresh. 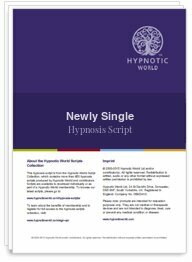 Download this Newly Single hypnosis script today so that your client, and all involved in their life, can move on and attain the peace and happiness they deserve.